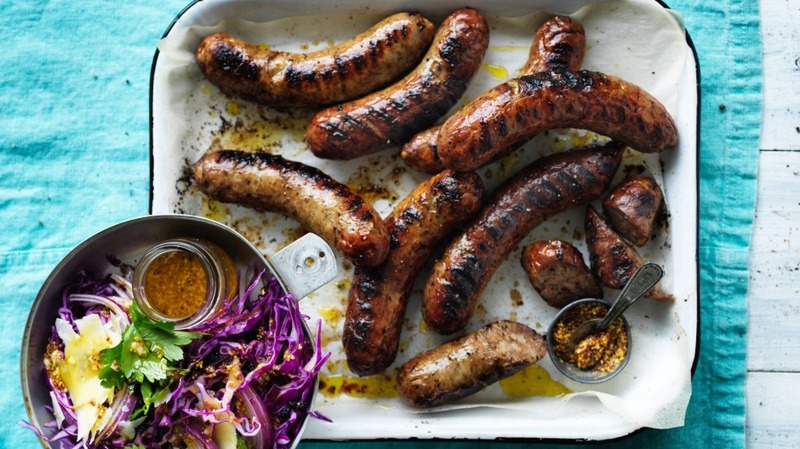 Pre-cooking sausages for barbecuing saves stress and time, and avoids the pitfalls of burst snags and burnt ends. 1. Bring a large saucepan of water to a simmer and poach the sausages until cooked through, about 10 minutes, then transfer to a hot barbecue or oiled frying pan and grill or fry until well browned. 2. For the red cabbage salad, whisk together the ingredients for the dressing until emulsified. Combine the cabbage, onion and currants and toss with the dressing. Scatter with parsley and parmesan and serve with the sausages. My custardy apricot puddings are a welcome finale to this meaty meal.